That chair could fit perfectly in your home, ready for the new netflix´s series. Also could be in Churchill's office ready for think about what he would tell to Elisabeth II on theirs Thursday meetings. The redesigned of the classic English lounge chair by Charles and Ray Eames, a marriage couple who wanted to bring back that piece of furniture and modernize it. 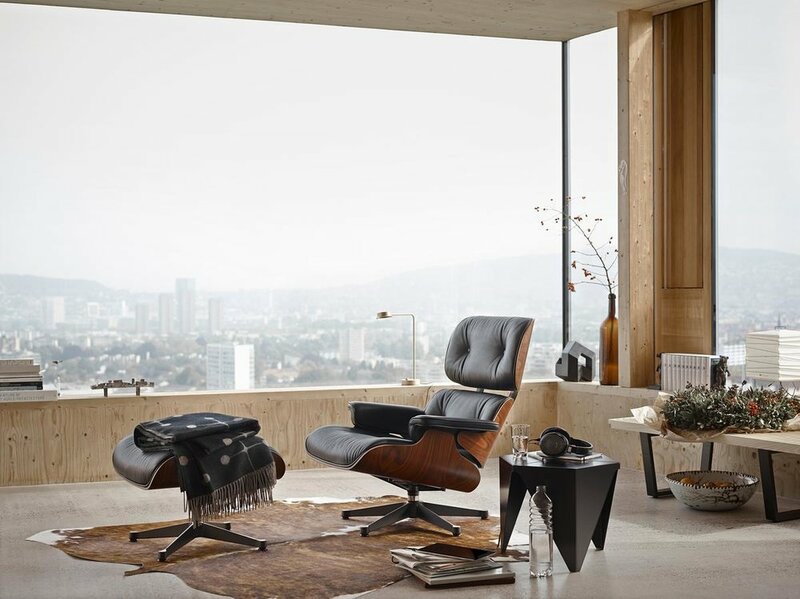 Vitra studio, an example to follow, can bring the Eames Lounge Chair with an perfect ottoman to our home. Just go to the web and choose. You can choose the size, the tipe and the colour of the leather. Madrid it's the sunniest European capital. People of Madrid are more on the street and at work than at home, endless hours in traffic jams, in the subway or waiting for a taxi to be able to get home and sit in an armchair that hugs you, soft and comfortable. The Grand repost and Panchica is an intelligent armchair, with an internal mechanism that allows the person to recline at any angle. The two pieces of the sofa move together to get the perfect position to forget the report that you have to write for tomorrow. Imagine a house in the middle of the Swedish forests, totally isolated while you're drinking a hot wine with canned herrings. Where do you think you are sitting? In an Organic Chair. Completely molded to your body, rigid but comfortable and very versatile. A chair that was born in the 40's and that was ahead of its time, until 1950 there was not a technique or a technologiy to make those curves in chain manufacturer. From the 1940s to the Como lake in Italy. It fits perfectly in all the mansions we can see from the lake like Queen Amidala's home or Clooney's Nesspreso house. Designed by Maarten Van Severen this deck chair has a single point of support, the elastic cloth fits perfectly to your body and by simply swinging backwards or forwards you can sunbathe in the best possible way. So...where do you want to go on holliday?